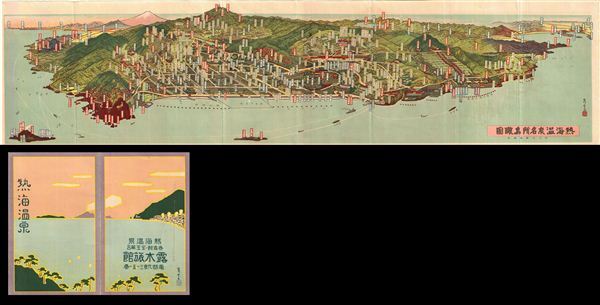 This is a stunning 1935 art deco panoramic view of Atami, Shizouka Prefecture, Japan. View shows streets, important buildings, ferry routes, roads, tunnels, and parks with Mount Fuji rising in the distance. This uncommon type of map evolved out of the exposure of traditional Japanese view-style cartography and western technology. Views like this began to appear in Japan, Taiwan, and Korea in the early 20th century. Generally speaking such maps coincided with the development of railroad lines throughout the once vast Dai Nippon Teikoku or Japanese empire. It is a distinctive style full of artistic flourish that at the same time performs a practical function. This particular example is both relatively early and exceptionally beautiful. It was printed via a multi-color lithographic process with delicately shaded tones and an easily comprehensible intuitive design. essentially a transportation map, it shows the major and minor rail lines throughout Atami, Japan. Atami is located in the far eastern corner of Shizuoka Prefecture at the northern end of Izu Peninsula. The city is set on the steep slopes of a partially submerged volcanic caldera on the edge of Sagami Bay. The name literally means 'hot ocean,' a reference to the town's famous Onsen hot springs. The city includes the offshore island of Hatsushima. Most of Atami is located within the Fuji-Hakone-Izu National Park. Warmed by the Kuroshio Current, the area is noted for its moderate maritime climate with hot, humid summers and short winters. Atami has been a popular resort hot spring resort since the 8th century A.D. In the Kamakura period, the Japanese potentates Minamoto Yoritomo and Hojo Masako were just two of its famous visitors. During the edo period, all of Izu Province was tenryo territory under direct control of the Tokugawa Shogunate. During the Cadastral Reform of the early Meiji period in 1889, Atami village was organized within Kamo District, Shizuoka. It was elevated to town status on June 11, 1894, and was transferred to the administrative control of Tagata District, Shizuoka in 1896.